What do “duplication of benefits” and “verification of benefits” mean? According to the Stafford Act, the federal government cannot pay for repairs that were already paid for by a different source, this is a duplication of benefits. Verification of benefits is the process used to verify the sources of aid provided in response to Hurricane Sandy, Hurricane Irene and Tropical Storm Lee. What are the Optional Resiliency Measures available? The three types of optional resiliency items available are Optional Elevation; Optional Mitigation; and Repair/Replacement of Damaged Bulkheads. Will I have to pay taxes on the assistance received? Because tax consequences may vary with individual circumstances, you should contact a tax professional for advice concerning your particular circumstances. 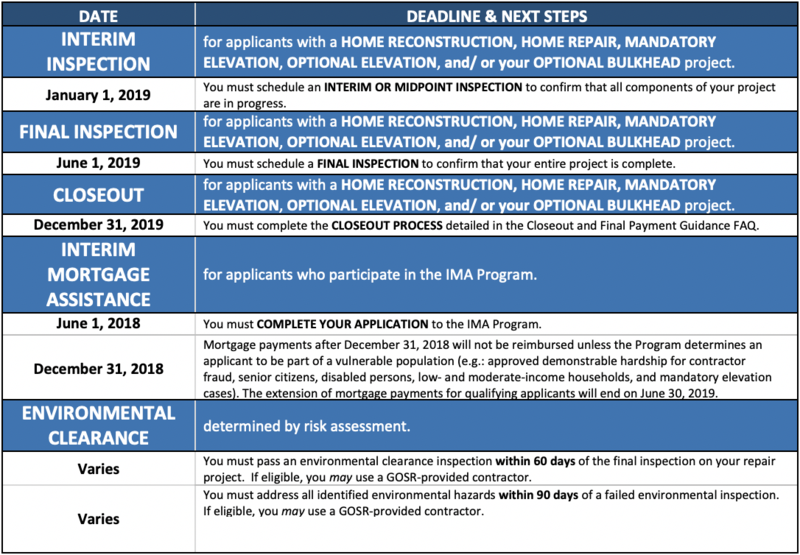 I am selling my home and I haven’t signed a Final Grant Agreement yet; what do I need to provide to the Program? You must complete the “closeout” process and sign your Final Grant Agreement before selling your home. To obtain a list of missing documents that you must submit in order to meet the closeout requirements and subsequently complete the sale of your home, please contact your Closing Specialist/ Customer Representative. I sold my home after receiving my Reimbursement funds and I now I’ve received a letter stating I am not eligible because I don’t own the home, and need to pay the funds back. What is going on? You may still be eligible to receive funds and/or keep funds already disbursed so long as you submit and pass the closeout and environmental requirements of the Program. This includes providing a copy of the Certificate of Occupancy if your home was deemed substantially improved or substantially damaged (or likely substantially damaged). To obtain a list of missing documents that you must submit in order to meet the Program’s closeout requirements, please contact your Closing Specialist/ Customer Representative.